finalists are placed on a ballot for enrolled students to vote on. The ballot box is usually located in the Student Center. All current full time teaching faculty members and adjuncts, who have taught six credit hours, are eligible for nomination. Professor Karrol Jordan was awarded Professor of the Year in 2009. She was deeply honored and overwhelmed to receive such a distinct privilege. In addition to Professor of the Year, a subcommittee of the Student Development Council selects an Advisor of the Year. The award was initiated by Dr. Steven Stolar in 1995, when he personally selected Dr. C. Fredrick Horbach. A memorandum is sent out in April by Dr. Stolar inviting all college personnel and members of Student Senate to nominate an advisor. A list of fifteen qualities is provided along with a request for evidence such as testimonies, statistics, and student outcomes. There have been fourteen advisors honored since 1995 including Dr. Lynn Lichtenberger, Director of Education Programs, who won in 2009. She had heard about the nomination, but did not really understand how the process worked so she put it out of her mind. At the President’s Award Ceremony she was amazed to hear the heavy competition for the award. “I was astounded and dumbfounded when they called my name. I was not prepared,” said Litchtenberger. She felt very emotional and teary. “Sitting on stage and carrying the flag at graduation was my actual reward,” she said smiling. To suggest a nomination for either Professor of the Year or Advisor of the Year, contact Derek Smith, President of Student Senate, at dsl530@student.cccnj.edu. Unless you have been living under a rock you have heard about the tragedy that happened in Haiti. On January 12, 2010 an earthquake that lasted a meagher 35 seconds changed the lives of hundreds forever. A 7.0 magnitude earthquake that hit Haiti, leaving thousands dead and thousands to mourn the loss of their loved ones. Families have been separated due to loss of communication. The damage that was done to Haiti is going to cost millions of dollars to fix. It is obvious they need help to repair their homes. People are suffering just to find find food and a place to lay their heads at night. One can only imagine what it must feel like to go through such a traumatic experience. Just the thought of children and ill people suffering even more should be enough for others to want to help. During times like these, we all need to come together and really lend a helping hand. We have all seen the celebrities donating money and making inspirational music videos for them. There have been commercials of President Barack Obama’s wife, Michelle Obama, making announcements to help the people of Haiti. Without hesitation many people here at Cumberland County College have already extended a hand to help out all the unfortunate people that have had to experience such a tragedy. CCC has done their part on helping the people of Haiti. The Amnesty Club held a “Hearts for Haiti” bake sale on Wednesday February 17. They were able to raise 300.00 dollars for Haiti relief. Teachers were also able to donate money which allows them to wear jeans on Wednesdays. All proceeds were given to Haitian relief. There were buckets at every basketball game after the incident so that people could donate as they pleased. Our hearts and thoughts go out to the people of Haiti. School stressing you out? You’re not alone! Do you ever feel like you’re overloaded or there’s so much on your mind, that you literally can’t think straight? Between work, school, exams, homework, family, and social life, it can be extremely stressful. People have so many stressful things going on in their lives these days. Stress can lead to some really bad things like an earlier age for a heart attack. What can people do to manage stress? There are many things people can do to manage stress, and it can be different for each person. If you’re an adventure seeking person, it will be different from someone who is calm, and they like their environments serene. One thing that can reduce stress is exercise. Kayla Dodge, a sophomore here, says, ”there is so much to do in my life between school, my job, and softball, that I get so stressed out. It’s hard to find time to do anything, but I know if I make the time to exercise, then when I sit down to do my homework, I’m more focused, relaxed, and awake.” Exercising three to four times a week with a forty-five minute cardio, and lifting some weights is beneficial. This can help release any excess stress in your life. If you like to exercise, some activities that you could try are a spin class, which is intense biking with some techno music in the background. The pedaling is really intense, and they turn off the lights to set the mood. Another type of exercise you could do is indoor rock-climbing. There are indoor facilities in New Jersey, where you go and they teach you what to do. The walls are extremely high and you could definitely get an adrenaline rush when you over 50 feet up in the air. The only thing holding you up is a suspension chord. If you like exercise, but you’re more of a relaxed person, you could try yoga. Yoga is all about deep breathing, and it will teach you how to breathe correctly, and this could calm you down in those stressful situations. It can also help with your flexibility. If exercising isn’t your style, you should try something else. Indulge yourself in something you enjoy. You could also make a whole day out of it, and go with a group of friends to a spa for the day, and you can get yourself pampered with massages, mud baths, facials, and many more treatments that they offer. on a mini-shopping spree. You can go to big expensive malls and stores, or if you’re looking for a bargain, you can go to the outlets such as the Atlantic City or Lancaster. Both are great save, big shopping areas. Being stressed is natural, when you are a student, but it does not help your GPA. People need to be more relaxed in their lives at school, work, and home. Maybe these helpful hints are just what you need to do some serious stress relief for the remainder of the semester. outlets such as the Atlantic City or Lancaster. Both are great save, big shopping areas. Being stressed is natural, when you are a student, but it does not help your GPA. People need to be more relaxed in their lives at school, work, and home. Maybe these helpful hints are just what you need to do some serious stress relief for the remainder of the semester. Are students taking on too much? These days, most people don’t hold just one title. They are no longer just a student, parent, or just a worker. Some are even all three! The responsibilities suddenly become demanding and the schedules become hectic. However, these tasks are all necessary and can’t be dropped. With all these new expectations, how does one manage? Lasheba Dougans, a student at CCC, has recently become a mother and finds it difficult to manage her time with all the tasks she has to accomplish. However, she has some help. “I’m grateful I have my mom to help take care of my baby whenever I have to go to school or work,” says Dougans. “Being a mom in itself is difficult, but adding being a full time student to that is extreme. However, education is a necessity these days in order to make progress in the future. Therefore it’s a responsibility most people take on in their lives’, she continued. The qualification for being a full time student is a student taking a minimum of twelve credits. However, there are students who take more. Some take on a course load of up to 19 credits! “I decided to take 19 credits last semester and it was crazy,” stated CCC student Diana DeHaro. Ameena Jones, also a student at CCC, is taking more than the minimum 12 credits as well and holds a part time job. The men’s basketball game against Northampton proved to be a historical moment for Roger Loatman when he made record breaking news by scoring his 1000 point. Loatman scored his first 195 points as a freshman and the remaining 805 points in his sophomore year. “You have to picture it and want it if you want to win,” said Loatman when he was informed of his achievement. He received the game ball. He is only the second student to achieve this record at CCC. Akheem Johnson reached 1000 points in the spring of 2009. “Akheem was my inspiraton,” said Loatman. Loatman has been playing basketball his entire life. He aspires to be an intelligent student and an incredible athlete. Roger Loatman shoots a 3 pointer. The men’s baseball team has already faced trouble this season because of the record-breaking amount of snow. With only two returning players, Anthony Caraballo and Eric Martinez, the Dukes are a fairly young team that is slowly getting more united. “It’s because a lot of us already knew each other from growing up together and playing against each other in high school,” stated team member David King. A factor that will bring the Dukes closer is the time they spend together at practice. The team attends two hour sessions Monday through Friday and four hour sessions on weekends. 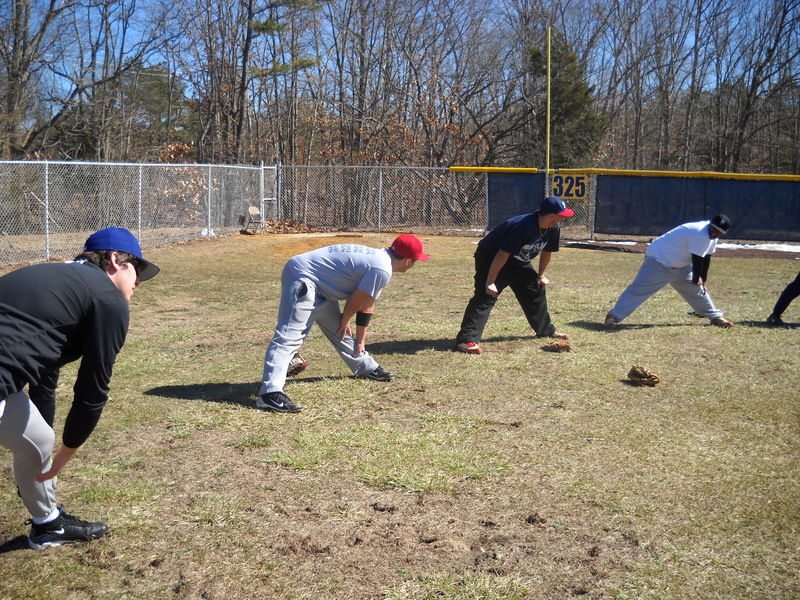 During practice, the team runs drills to incorporate bunting, base running, and defensive strategies while other practices cover pitching, hitting, and offensive strategies. “Overall, it would depend on our team weaknesses and strengths,” explained Coach Rodriguez. “Those are the factors that will guide us in the correct path of proper selective practice strategies”. Coach Rodriguez ensures that all players practice different positions. Each player has some knowledge and experience playing every position and that makes it easier to face whatever happens in a game. “For example, if our starting shortstop were to get hurt during a game, then one of us could just fill in for him and still know what we’re doing,” explained King. The Dukes’ teamwork and skills will definitely be put to a test when they attend the Cocoa Expo Tournament in Cocoa, Florida during spring break. The team has not been informed of the opponents they will be facing, but they expect tough competition. Overall, Coach Rodriguez is confident in his team and their success this season. It appears that neither snow nor any other factor can stop the Dukes’ determination . The Dukes Baseball Team stretches before practice. When I’m making decisions I always say to myself, “if I don’t go, am I going to regret it?” I never want to skip out on a night out with my friends just in case something crazy or funny happens. It’s no fun listening to them talk about something hilarious that happened and all I can do is imagine it. The important thing to keep in mind is you. One bad choice can steer your life in a route you never imagined. Drinking and driving is a huge life changing decision that can change within seconds. No one ever thinks it can happen to him or her until it’s too late. That’s when all your “what ifs” come to mind. It can get pretty scary. One minute everyone is laughing and having a great time. The next thing you know you’re at the hospital waiting to see if your friend made it. It’s just not worth it. On a lighter note some decisions you make can turn out to be the best thing you ever did. Vicky Ruiz, a student a Cumberland County College, said “Going to a community college before going to a four year school was the best thing I could have done. It has turned out to be so much cheaper for me.” On the other hand there are people who are fortunate enough to go straight to a four-year college with no trouble at all. It’s funny how sometimes you wish something had turned out differently. If you could, you would turn back time and make things how you want. Then one day you realize that everything happens for a reason and you are actually happy with how things turned out. Life is one decision after another. It’s up to you if you want to live life asking yourself “what if?” So the next time you’re thinking of making a decision make sure you won’t regret it.